I was born in Cincinnati, Ohio, but moved with my family when I was five years old to Miami, Florida. What a great place to grow up and come of age. “I remember my very first day in school, the teacher asked who the artist was in class. I raised my hand knowing it was me but I didn’t know what an artist was.” In my heart, I just knew. My mother has always been my inspiration. She was a nurse but on her days off, she would paint. I would come in from school and watch her paint very detailed Clipper Ships. I did not know this was being an artist. She had so much fun, that that was all I wanted to do too. When I was fifteen, I was enrolled in a Commercial Art Program for three years. That was a very good all around foundation for any artist. After that, it was college but I was too antsy to stay with it, I just wanted to paint. Being young I thought I knew everything. After getting married at twenty-one and having a child I worked hard on my art at home. Since I did not drive, my husband would take me to the public library on Saturdays and I would check out all these big, heavy art books. My interests back then was Rembrandt, for his genius on value and contrast. Rembrandt remains to this day my greatest influence on how I can continue to paint. I absolutely loved Van Gogh for his freedom with color and brushwork. When I discovered Edgar Degas, I fell in love. I read each and every one of those big books. If only we had computers and the internet back then. I have taken workshops and seen countless demonstrations. At some point, you have to just focus and do the work. This is what I have done. I paint every day and when I do not, I get cranky. Linda Dragonette is an award-winning artist who has been in numerous Regional, National and International Exhibitions. 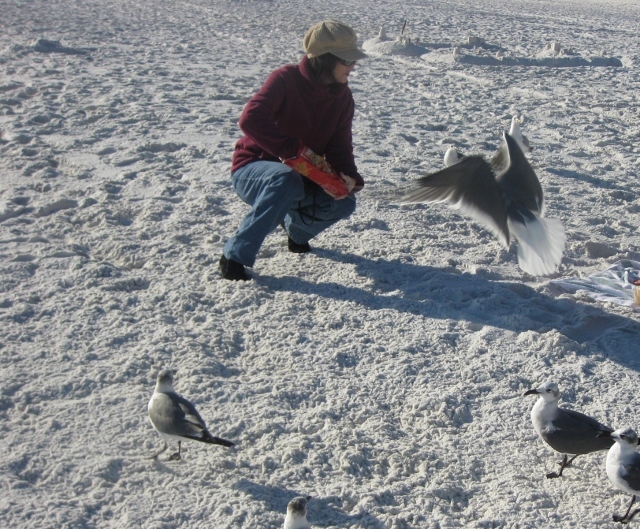 Linda is a Member of Excellence , Signature status of the Southeastern Pastel Society and the Pastel Society of North Florida. She recently earned her Signature status with the Pastel Society of the West Coast. She is a Juried Member of Oil Painters of America and Landscape Artists International. 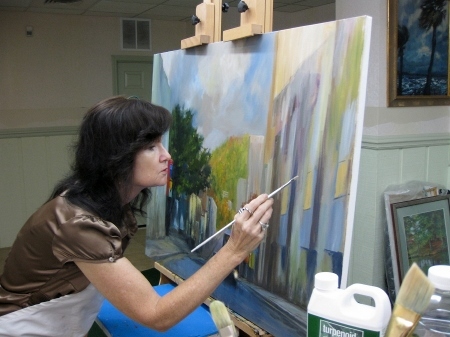 Earlier this year she was accepted into Women Painters of the Southeast. “The work I do today is mostly oil palette knife. Value is how I continue to paint. I have lost the majority of my vision due to a hereditary eye disease called Retinitis Pigmentosis. I basically started losing my vision the day I was born. While this has certainly been a hardship I have not let it stop me. My current love is birds. I love all birds but get such a kick out of Sea Birds. 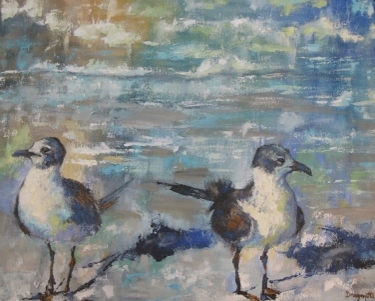 I continually paint Sea Gulls, Sandpipers, Great Blue Heron. They all have such personalities and attitudes. I love watching them watch us. We should all use the gifts we each possess to actively participate in the world around us. I have worked on a variety of projects in my life. But the most rewarding was starting a grass roots non-profit organization for endangered animals. We had projects here and in Africa. We focused on the young orphaned animals that are always left behind. I created two wildlife posters that were used in our public service announcements. National Geographic Magazine ran our public services announcements from 1989 through 1992. They loved what we were trying to do and gave such wonderful support.